Below is a list of the tiaras worn by the women of the British royal family's Kent branch. Click on the title of the tiara to be taken to pages with fuller histories, images, and much more information. Enjoy! The Argyll Diamond Daisies: A group of diamond brooches in daisy and leaf shapes, sometimes grouped together for wear as a tiara-like ornament. Originally belonged to Princess Louise, Duchess of Argyll (who wore them as brooches at her wedding in 1871). Later bequeathed by her to Princess Marina, Duchess of Kent, and then passed to Prince and Princess Michael of Kent. 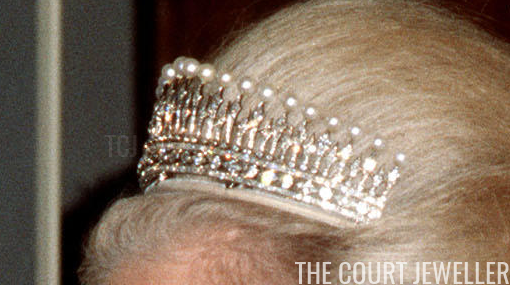 Worn as a tiara-like ornament by Princess Michael of Kent. The Cambridge Sapphire Button Tiara: A simple tiara made of a quintet of button-style sapphire and diamond festoon and cluster elements set atop a velvet-wrapped wire frame. Made using pieces from the long necklace from the Cambridge Sapphire Parure (which was made in the nineteenth century for Princess Augusta, Duchess of Cambridge and passed down to Grand Duchess Augusta of Mecklenburg-Strelitz; Queen Mary; Princess Marina, Duchess of Kent; and finally the present Duke and Duchess of Kent, who sold much of the set in the 1990s). Worn by the present Duchess of Kent. The Kent City of London Fringe Tiara: A classic Russian-inspired diamond tiara made of a series of fringes and spikes. Given to Princess Marina, Duchess of Kent as a wedding present from the City of London in 1934. Inherited by Prince Michael of Kent in 1968. Worn by Princess Marina, Duchess of Kent; Princess Alexandra, the Hon. Lady Ogilvy; and Princess Michael of Kent. Worn as a wedding tiara by Princess Alexandra (1963) and Princess Michael (1978). The Kent Pearl Festoon Tiara: An elaborate, elegant tiara of diamond scrolls and festoons, embellished by a series of round pearl toppers and a row of round pearls at its base. Originally belonged to Princess Marina, Duchess of Kent. Inherited by Prince Michael of Kent in 1968. Worn by Princess Marina, Duchess of Kent; Princess Alexandra, the Hon. Lady Ogilvy; and Princess Michael of Kent. The Kent Pearl Fringe Tiara: A delicate, bandeau-style fringed diamond tiara with a diamond and dot base, surmounted by a row of round pearl toppers. Likely a remodeled version of a diamond bandeau, worn as a wedding tiara by the present Duchess of Kent, from the collection of Queen Mary. Currently owned by the present Duke and Duchess of Kent. Worn by the present Duchess of Kent, the present Countess of St. Andrews, and Lady Helen Taylor. Worn as a wedding tiara by Lady Helen (1992). Lady Frederick's Wedding Tiara: A petite diamond tiara with a coordinating hair comb. Worn as a wedding tiara by Lady Frederick Windsor (2009). 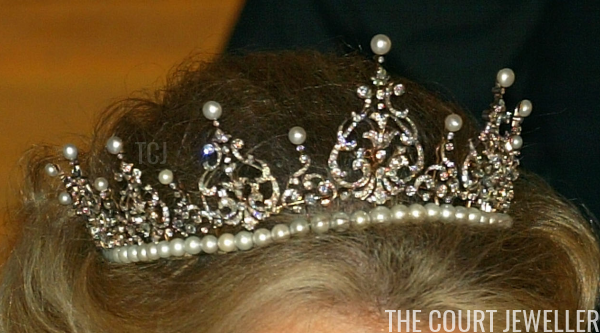 Lady Nicholas's Diamond Tiara: A low-profile, bandeau-style diamond tiara. Worn by Lady Nicholas Windsor. Lady Nicholas's Sapphire Necklace Tiara: A diamond and sapphire festoon and drop necklace, able to be placed on a frame and worn as a tiara. Worn by Lady Nicholas Windsor. 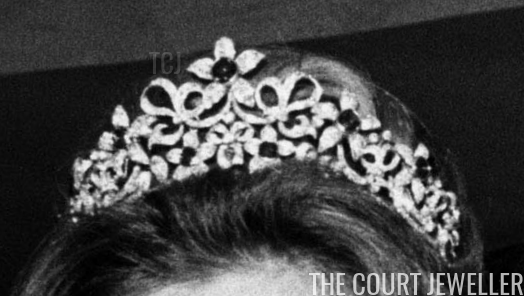 The Ogilvy Tiara: A diamond tiara with floral and ribbon designs, able to be worn with an interchangeable set of pearl, turquoise, and sapphire stones, accompanied by additional coordinating pieces to form a parure. Commissioned from Collingwood by Sir Angus Ogilvy as a wedding present for Princess Alexandra of Kent in 1963, and made using an existing set of diamond floral hair ornaments. Worn by Princess Alexandra, the Hon. Lady Ogilvy.